For the next few tracks, I’m moving to my neighboring country to the north, Canada. I have (unintentionally) only posted one track from here, so it’s time for some more. 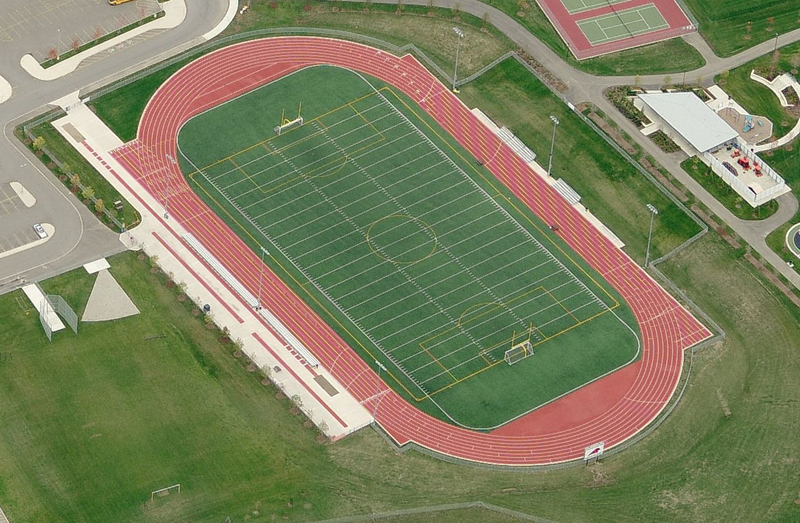 Today’s track will be this site of the Ontario Federation of School Athletic Association’s high school championships. The OFSAA meet is being held at St. Marcellinus Secondary School over three days next weekend, June 5-7. This looks like a very nice facility. The track has eight lanes. All field events seem to be on the outside. There is a nice area for the horizontal jumps outside lane eight, but on the main straightaway, which is kind of unusual. Most of the time they’re on the backstretch where they are more out of the way. I’m also not sure where they hold the high jump. The end zones for Canadian football are much deeper than American football, so the D-zones of the track are much smaller. It doesn’t look like there is enough room for the high jump, unless the just start the approaches on the infield first.